This is definitely a departure from the usual posts. But, the two of us have jumped on the Instant Pot trend and it has quickly become a member of our family, one we can no longer imagine our lives without. In my last post, I spoke of the incredible lentil and bean burger I had at the Blue Dog Cafe in Invermere. Since then, I've been inspired to make it using the Instant Pot, but none of the recipes have totally caught my attention. I suppose this is sort of date night related 😏, but hubby and I decided to come up with our own vegan lentil black bean burger recipe using the Instant Pot. Not only were the results AMAZING, but our burger also kept together when pan fried. And, here is the final result. The recipe below was inspired by this recipe for vegan lentil burgers. 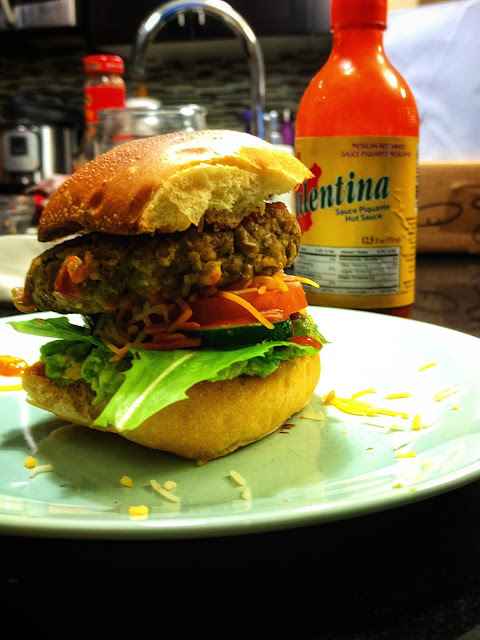 Things to do in Calgary: Stay-at-Home-Date: Instant Pot Vegan Burgers! Any seasonings you like, we added some paprika, chili powder, and Serrano chili powder (found at the local Silk Road Spice Merchants in Inglewood). Turn Instant Pot on medium saute mode. Add oil to coat the base. Cook onions and carrots in oil until onions are translucent. Add lentils, beans, corn, jalepeno, and salt and pepper to pot. Release pressure naturally for 10 minutes, quick release the rest. Add soy sauce, bread crumbs, and rolled oats. If lentil-bean mix appears too watery, turn on saute mode and reduce until mixture appears thick. Line a pan with parchment paper and scoop out 1/2 cup measures, shape mix into patties. Let patties rest about 10 minutes before pan frying them with PAM. Top your burger with your favorite fixings. We used tomatoes, cucumbers, homemade guacamole, cheddar cheese, salsa, and lots of Valentina's sauce.